Serve up a sweet treat for Halloween. 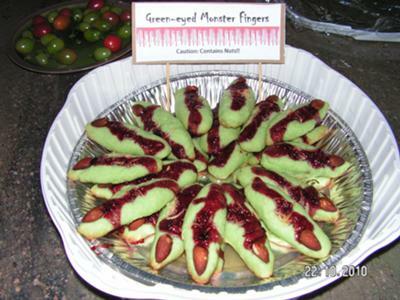 The kids will love these "bloody" green monster fingers. 1. Preheat oven to 350F (180C) degrees. 2. Cream butter and sugar together for about 35 to 40 seconds. Add egg, egg yolk, vanilla extract, chopped nuts, and green food coloring and mix well. 3. In separate bowl, sift flour, baking powder and salt. 4. Add flour mixture to creamed mixture and stir to blend well. 5. Shape dough into 3 - 4 inch rolls, with one side tapered. 6. Place whole almond at pointed tip of roll for fingernail. 7. Use knife to put 3 small slits in finger underneath the fingernail. 8. Press a small indent with your thumb into center of roll for a knuckle. Add shredded coconut into indented knuckle area. 9. Place fingers on ungreased baking sheet 1 - 1 1/2 inches apart. Bake for 15 minutes or until coconut is toasted and cookie is slightly browned. 11. Prepare jam. For best results, use a dark red "thinner" jam. If thick, warm jam slightly until it liquefies. Spoon jam over cookie for "blood" effect. My son's birthday is on Halloween and I am always looking for a new recipe idea to make for the party....so glad I came across this recipe!!!! I know it is going to be a hit! Awesome!!! Belinda made them for our kids' Halloween party and they were a huge hit!! Rylan loved them, I'm sure they're delish -- but look oh so spooky and gross!! -- perfect for Halloween!